Just like in the spring, you need to prepare the soil before planting in the fall. I top dress my garden beds with composted goat manure from our goat barn or rabbit poo before planting any time of the year. The better the soil, the better the crop! Water is always important, but it is even more so for fall crops. The soil dries out quickly this time of year, which simply will not do for direct sowing seeds for slower to germinate veggies, such as carrots or parsnips. The soil needs to be kept moist around 7-10 days. Once the seedlings emerge, they will still require moist soil, the seedlings will dry out as quickly as the soil this time of year. The best way to keep moisture in the soil is with mulch. Mulch, mulch and more mulch! Mulch is a must in the garden any time of the year. Besides weed control, a thick layer of mulch will keep the soil warm and will protect plants from light frosts in the fall. I like to think of it as a nice layer of insulation. 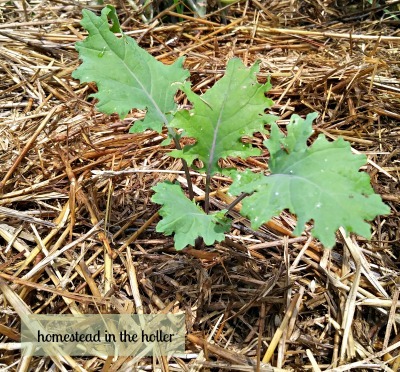 I have used straw and wood chips as mulch and have had great results with both. As long as the bare earth is covered, preferably with something that will break down and give you more organic matter and soil, you are set! If you want to keep your garden going during hard frosts, you need to go one step further. 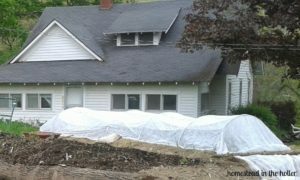 Row cover is the best way to extend the season and to protect your crops without purchasing a greenhouse. It is also called garden fabric, or floating row covers. It’s basically making a mini greenhouse right over a garden bed in your garden. Row cover will make your fall gardening a smashing success! Protect your seedlings from the hot summer sun by filtering the sunlight. Agribon is the brand of row cover that I use. It’s a non-woven fabric that is ultra light weight and will protect plants from frost. Agribon comes in different grades which offer varying degrees of protection while still allowing light, water and air to pass through. 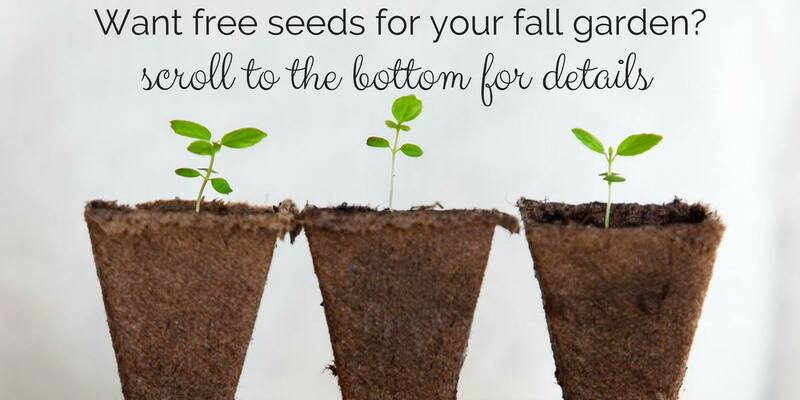 You can use this to extend your growing season spring and fall. I use AG30, which is a medium weight row cover and will protect plants down to 26F. Add in a thick mulch layer and you can move that number down a few more degrees! Agribon comes in a large roll, you cut it to the length you need to cover any size garden bed that you wish. AG30 row cover was a game changer for me and my success in extending the season. How you use the row cover is up to you. You can lay the cover down over top of your garden bed or you can make a mini hoop house right over your garden bed. I prefer to make a mini hoop house. This way I can plant, water and mulch my fall garden and then cover it up right away for protection. PVC pipes can be used or you can buy a pipe bender to use metal pipes. I have been able harvest spinach and lettuce well into December here in southern Missouri. Kale has grown all winter! I plan to try root crops this year under the row cover. I have successfully started carrots and beets in February under row cover but haven’t tried root crops in the fall. Keep in mind that the cooler temperatures and shorter days will slow down the growth, but you’ll still get a harvest! Time for the seed giveaway! 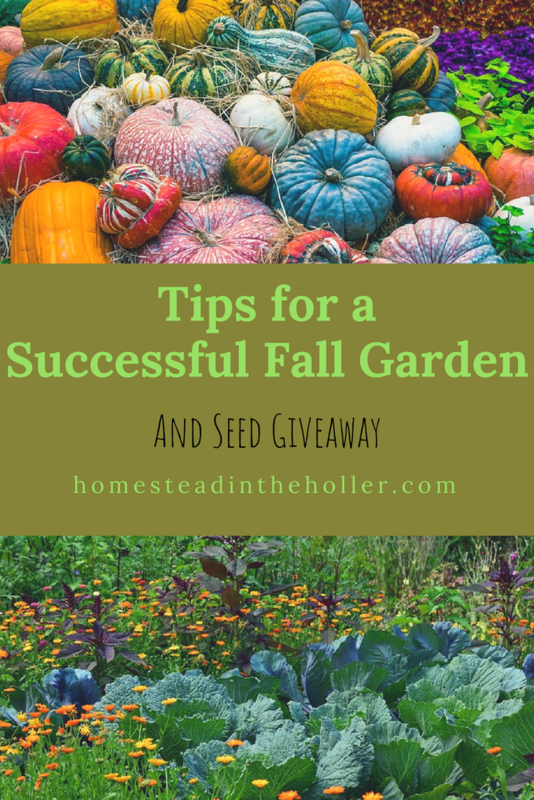 I’ve teamed up with some amazing homestead bloggers for a great seed giveaway! Bakers Creek Heirloom Seeds has generously offered to give 12 seed packets, perfect for fall planting. 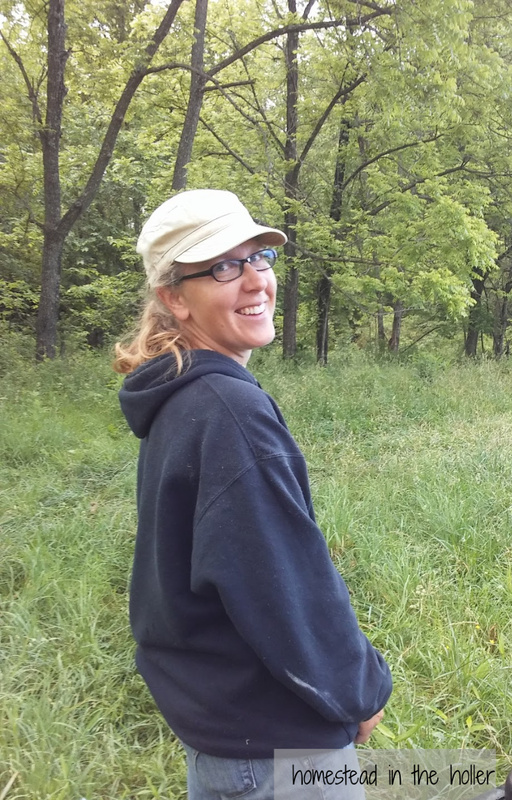 The Inquisitive Farmwife – Gardening Woes, but it’s NOT to late! Our giveaway begins Monday, July 23, 2018 at 6am Central Time and ends on Monday, July 30th at 7am. This giveaway is open to U.S. residents, must be at least 18 years old. We will announce the winner on Monday night and the winner will have 36 hours to respond or another winner will be chosen. Winner will be chosen at random through Giveaway Tools. No duplicate entries. There is one “free” entry per person, plus 11 additional entry points possible, one for each task completed. 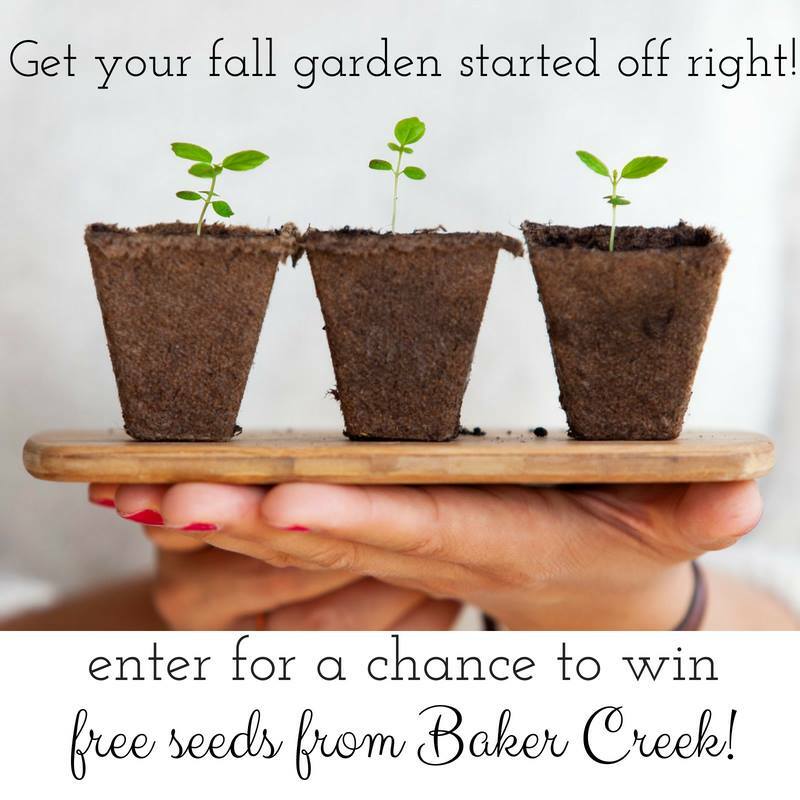 The prize will the winner by Baker Creek Heirloom Seeds be shipped directly to the winner. Enter using the form below. After completing each entry option, be sure to come back here and click “Submit” so your entry will be valid. This entry was posted in Garden and tagged Agribon, cool weather crops, extending season with row cover, fall garden, fall garden tips, gardening in fall, how to extend the season, how to garden in the fall, row cover, row cover hoop house. Bookmark the permalink. Great tips! I always forget about the fact that mulch also acts as an insulator. I think I’ll be trying out row covers this year. I’ve meant to in the past, but it’s never worked out. I’m hoping to have a successful fall garden! Speaking of which, I’d better get out there and do some watering! This is definitely a drought here! 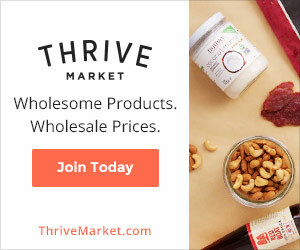 There are some great tips! I’ve never been successful at fall gardening, but you’ve given me a plan and some hope. Thanks! I’d never heard of row cover before. I am going to share this thought with my husband, who is my partner in gardening. It really is a game changer when extending the season!! 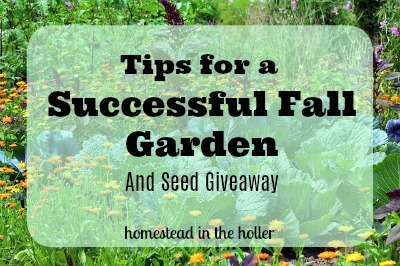 Never had good luck with fall gardening but these good tips may help that! Going to try some things! Hope my luck will be better! I love that image of all of the winter squash! I’ll have to try a fall garden next year. Trying to add goats this fall, and I have an infant, so that’s all I can handle, lol. I need to be better about row covering!!!! thank you for telling us about the row covers. I’ll remember this when we once again live in a place we can put in a garden. Awesome giveaway – thank for hosting! 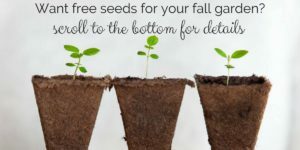 Awesome tips, I’ll be referring to them since this will be our first time planting a fall garden! I love using season extension. It never stops amazing me just how much you can still grow and harvest by using them even though the season is winding down and winter is on the way. Great tip for using organic mulch to insulate and feed the soil!